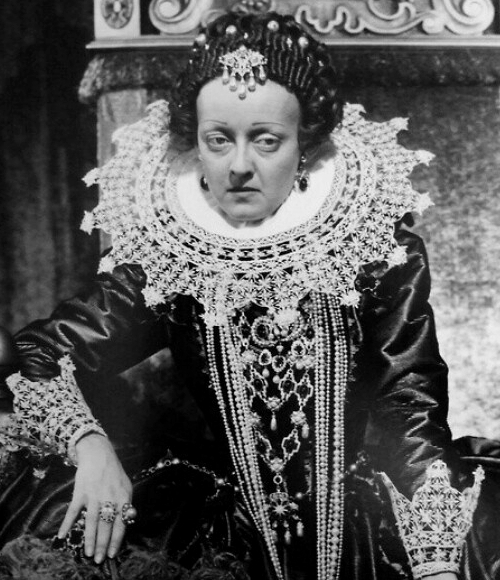 Bette Davis also played the Tudor Queen twice. Her first portrayal was in the film THE PRIVATE LIVES OF ELIZABETH & ESSEX (1939). 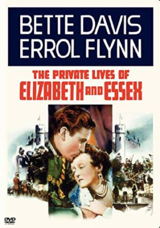 Errol Flynn once again played the courtier, this time Robert Devereux, Earl of Essex, whose love for the Queen is not enough to stop him seeking power. A convincing portrayal of Elizabeth from this great actress, and the real life tension between Flynn and Davis added chemistry to their onscreen performance. 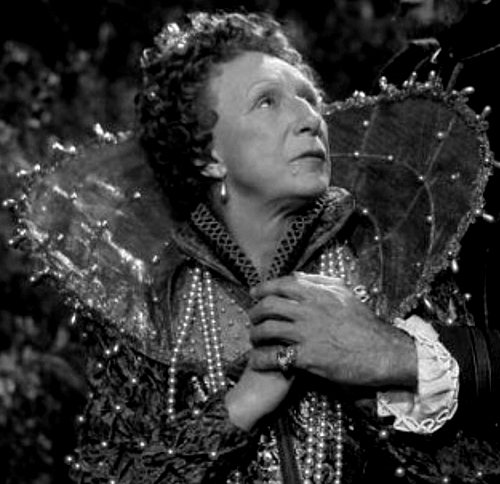 Davis's second portrayal was in the film THE VIRGIN QUEEN (1955). This tells the story of Sir Walter Raleigh, played by Richard Rodd. A young Joan Collins stars as Raleigh's wife, Bess Throckmorton. 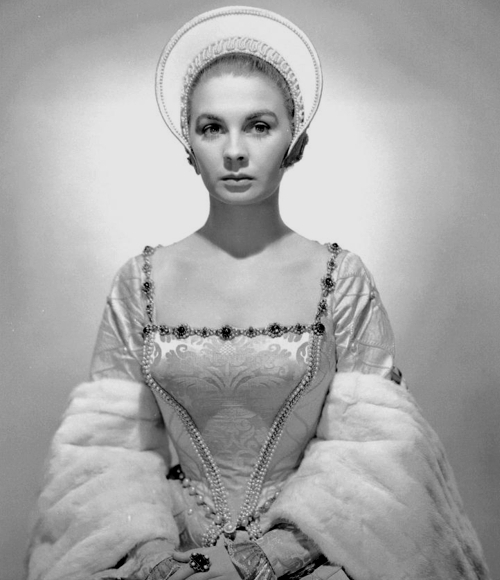 Jean Simmons starred as a teenage Elizabeth in the 1953 film Young Bess. This film was adapted from the novel of the same name by Margaret Irwin. 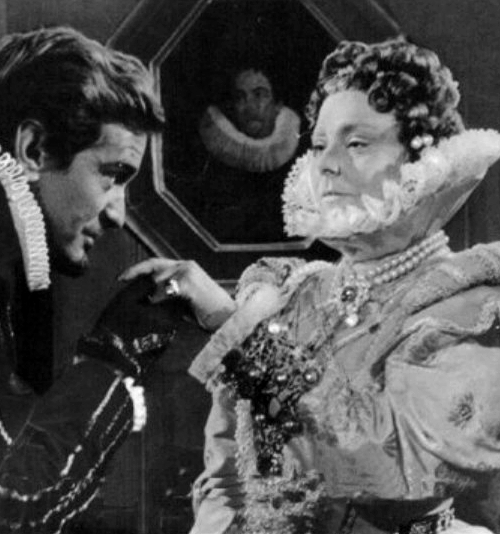 Simmons's husband, Stewart Granger, played the impetuous Thomas Seymour, Lord High Admiral, and Deborah Kerr played Catherine Parr. It is an unashamedly romantic interpretation of the controversial relationship between Elizabeth and Seymour. Irene Worth played Queen Elizabeth in Seven Seas to Calais (1962). Set in the Armada years, it tells the story of Sir Francis Drake (played by Richard Todd) who not only succeeds in conquering the seas, but in winning the heart of the Virgin Queen herself. Judith Anderson played the Queen in a 1968 American series called Elizabeth The Queen. Again, the Queen's tumultuous relationship witb the Earl of Essex was the focus. Charlton Heston played the doomed Earl. 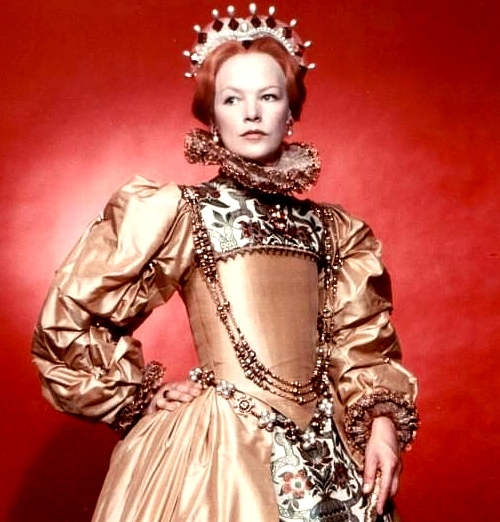 Glenda Jackson perhaps proves herself the greatest of the screen queens in the wonderful BBC series Elizabeth R (1971). 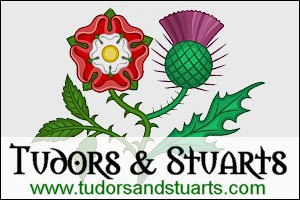 This six part series chronicles Elizabeth's life from the reign of her brother, Edward VI, until her death in 1603, and remains the best ever dramatistion of the Queen's life. Not only does Jackson give a powerful portrayal of the Queen, but the scripts are well written and historically accurate. 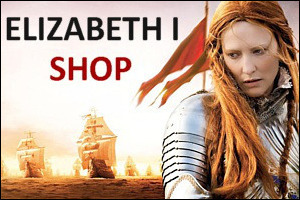 No other series, to date, has recreated the Elizabethan world as faithfully. There are also strong performances from Robert Hardy, as The Earl of Leicester, and Ronald Hines as William Cecil. When the series was first broadcast, the scripts were published in a single volume, edited by J. C. Trewin, Plays of the year special, Elizabeth R. The book is now out of print, but copies are sometimes available from used books shops. Jackson repeated her performance as Elizabeth in the 1971 film Mary, Queen of Scots. Vanessa Redgrave played Mary Stuart. This film isn't as historically accurate but is well acted and produced. 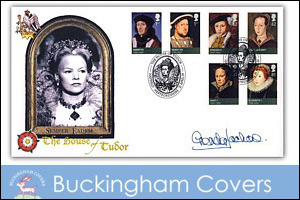 Elizabeth I tribute stamp sets signed by Glenda Jackson are available from Buckingham Covers.